Foreign correspondent Reese Erlich presents his newest book. Based on frequent, first-hand reporting in Iran and the United States, The Iran Agenda Today explores the turbulent recent history between the two countries and reveals how it has led to a misguided showdown over nuclear technology. Foreign correspondent Reese Erlich notes that all the major U.S. intelligence agencies agree Iran has not had a nuclear weapons program since at least 2003. He explores why Washington nonetheless continues with saber rattling and provides a detailed critique of mainstream media coverage of Iran. The book further details the popular protests that have rocked Tehran despite repression by the country’s Deep State. Copies of The Iran Agenda Today will be available for purchase and autographing at this event. Advance copies can be purchased directly from the publisher. Reese Erlich’s history in journalism goes back over 40 years. He first worked as a staff writer and research editor for Ramparts, an investigative reporting magazine published in San Francisco. Today he works as a full-time print and broadcast, freelance reporter. He reports regularly for ABC (Australia), Radio Deutsche Welle and National Public Radio. His articles have appeared in Politico, Foreign Policy, VICE News and The Progressive. His television documentaries have aired on PBS stations nationwide. Erlich writes a syndicated column “Foreign Correspondent,” which appears every two weeks in The Progressive and other websites. He also maintains his own website where you can read many of his other essays and articles. Erlich’s book, Target Iraq: What the News Media Didn’t Tell You co-authored with Norman Solomon, became a best seller in 2003. 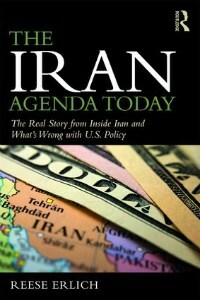 The Iran Agenda: The Real Story of US Policy and the Middle East Crisis was published in 2007. Dateline Havana: The Real Story of US Policy and the Future of Cuba was published in 2009. Conversations with Terrorists: Middle East Leaders on Politics, Violence and Empire, was published in September 2010. Inside Syria: the Backstory of Their Civil War and What the World Can Expect, foreword by Noam Chomsky, appeared in October 2014. The updated, paperback edition was released in September 2016. Erlich shared a Peabody Award in 2006 as a segment producer for Crossing East, a radio documentary on the history of Asians in the US. In 2004 Erlich’s radio special “Children of War: Fighting, Dying, Surviving,” won a Clarion Award presented by the Alliance for Women in Communication and second and third place from the National Headlines Awards. His article about the U.S. use of depleted uranium ammunition was voted the eighth most censored story in America for 2003 by Project Censored at Sonoma State University. In 2002 his radio documentary, “The Russia Project,” hosted by Walter Cronkite, won the depth reporting prize for broadcast journalism awarded by the Northern California Chapter of the Society of Professional Journalists. This entry was posted in Current News and tagged Erlich, Iran, Nuclear Weapons, Reese, Reese Erlich by PPJC Admin2. Bookmark the permalink.